Photo courtesy Smith Aerial Photography/Advanced Roofing Inc. Savvy roofing contractors have preferred asphalt for low-slope roofing systems for more than a century. Through innovative research and development, low-slope asphalt roofing is continually advancing, making these systems more installer-friendly while maintaining their superior reliability and durability. The two main types of asphalt roofing systems for commercial, industrial, and institutional buildings are modified bitumen (mod-bit) and built-up roofing (BUR). Mod-bit and BUR offer tremendous system versatility, long-term weatherproofing protection, and of course, redundancy, characteristics that make them popular in any geography or climate. Both system types consist of multiple layers, which provide durability and stability, and make these roof membranes especially tough and water-resistant. Their redundant structure and overall system thickness enhance the ability of both mod-bit and BUR systems to stand up to the forces of man and Mother Nature. availability of materials and qualified installers. While mod-bit and BUR have a lot of similarities, they have different installation methods, providing various options in order to accommodate the challenges posed by low-slope roofing applications. Mod-bit sheet materials are composed of polymer and asphalt-modified bitumen with one or more reinforcing fabrics such as polyester, glass fiber, or a combination of both. Not only is mod-bit an affordable roofing choice, it is easy to install, highly weather-resistant, and has a long history of use in numerous applications. The difference between mod-bit and BUR is that the asphalt used in manufacturing the mod-bit systems is modified by one of two polymeric materials: atactic polypropylene (APP) or styrene-butadiene-styrene (SBS). These modifiers help enhance specific physical and mechanical properties of the asphalt for use in different applications. 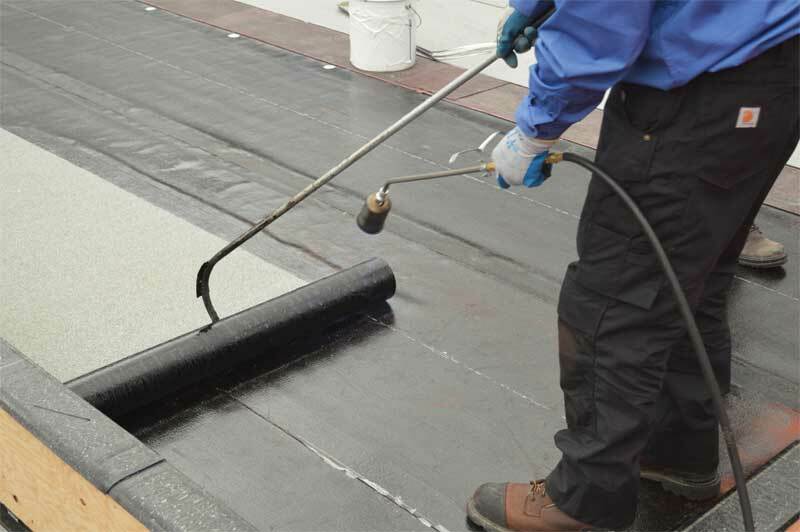 Cold adhesive is applied by a roofing professional using a roller. Photo courtesy IKO Production Inc.
APP-modified bitumen is modified with a plastic (polypropylene) polymer that creates a uniform matrix within the bitumen. This increases the membrane’s flexibility and resistance to high temperatures, as well as improves its resistance to ultraviolet (UV) light. APP “plastic” modifier additive is combined with the asphalt to provide a tougher, better weathering asphalt coating that can be heat-welded or applied with cold adhesive. SBS-mod-bit has superior elongation and recovery properties over a wide range of extreme low and high temperatures, and when properly installed and maintained, it is designed to result in a resilient waterproofing membrane. The material is also durable and versatile, allowing movement or deflection of the underlying deck. SBS “synthetic rubber” modifier is combined with asphalt to provide an elastomeric asphalt coating. SBS membranes may be applied using a variety of methods: heat welding, cold adhesive, self-adhered, mechanically fastened, and hot asphalt. BUR systems consist of multiple layers of hot- or cold-applied liquid asphalt alternated with ply sheets (felts) applied over the substrate, typically an insulated assembly. It is a popular low-slope roofing system option due to its superior protection against leakage when compared to single-ply systems. Topped with a mineral-surfaced cap sheet, gravel surface, or coating, BUR systems also help to safeguard the substrate materials from ultraviolet (UV) rays, while adding enhanced fire resistance. 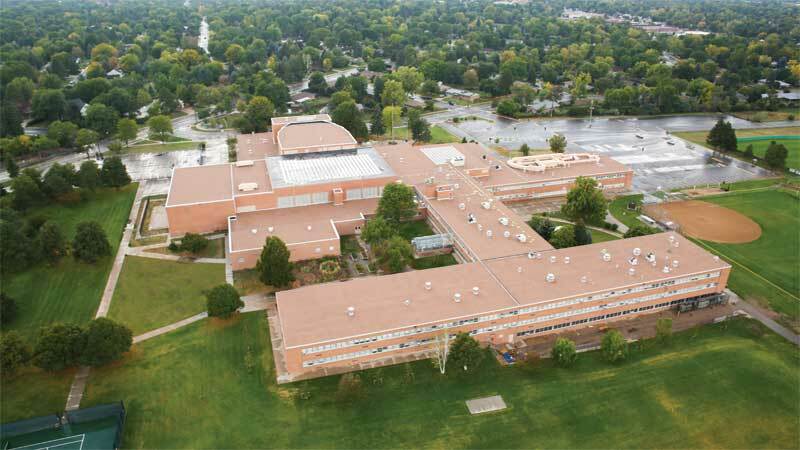 An example of a mop-applied built-up roofing system is the Thomas Jefferson High School in Denver, Colo. After years of enduring hot sun, freezing snow storms, and heavy wind and hail, the school’s roof was suffering from leaks. It required immediate attention before it reached a critical stage of deterioration.Using a high-quality BUR system, D&D Roofing of Commerce City, Colo., installed a new, energy-efficient roof. It helps protect the school from Colorado’s intense weather, especially the threat of hail. A vapor retarder, cover board, two layers of insulation, and four plies of felt were installed to give the school a weather-resistant roofing system. Due to asphalt’s ease of installation, D&D Roofing was able to meet the project’s deadline and provide the school district peace of mind knowing their school had multiple layers of water-resistant technology. Mod-bit systems typically consist of a combination of a base ply and a cap sheet applied over the insulation substrate or base sheet. For BUR, there are generally three or four plies of hot asphalt or cold-adhesive applied roofing felts. This redundancy improves system durability and provides extra assurance against leaks. The numerous layers are difficult to pierce or puncture, further adding to the roof’s primary purpose—maintaining a long-term, water-resistant barrier that protects against the elements. A mod-bit system has elongation and recovery properties, while the numerous layers of BUR yield a strong, flexible membrane. Both of these mechanisms are capable of dealing with extreme temperature changes and normal building expansion and contraction. These roof membranes, as part of the building’s thermal envelope, exhibit superior resistance to the conduction of heat between the exterior and interior of the building. According to a 2013 study conducted by the Midwest Roofing Contractors Association titled, “Field Study Results of Reflective Modified Bitumen Roofs,” mod-bit roofing membranes have proven to be a very competitive low-slope roofing option due to their impressive thermal performance and high reflectivity. A cap sheet is heat-welded by a roofing professional using a torch. ASTM D6509, Standard Specification for Atactic Polypropylene (APP) Modified Bituminous Base Sheet Materials Using Glass Fiber Reinforcements. ASTM D312, Standard Specification for Asphalt Used in Roofing, among others. Mod-bit and BUR systems are tested according to stringent industry standards, including ASTM E108, Standard Test Methods for Fire Tests of Roof Coverings, Factory Mutual (FM) 4474, American National Standard for Evaluating the Simulated Wind Uplift Resistance of Roof Assemblies Using Static Positive and/or Negative Differential Pressures, Underwriters Laboratories (UL) 790, Standard Test Methods for Fire Tests of Roof Coverings, and UL 1897, Uplift Tests for Roof Covering, Systems, to meet fire-resistance requirements and ensure adequate uplift resistance, enhancing their safety and durability. Many mod-bit and BUR systems have incorporated innovations that reduce labor time and costs, such as mechanized spray or spreading equipment for adhesives, fast-to-apply self-adhered technologies, and automated welding devices, among others. Compared with other high performance commercial roofing systems, mod-bit and BUR are some of the most economical choices over the long-term due to their superior weather protection and longevity. 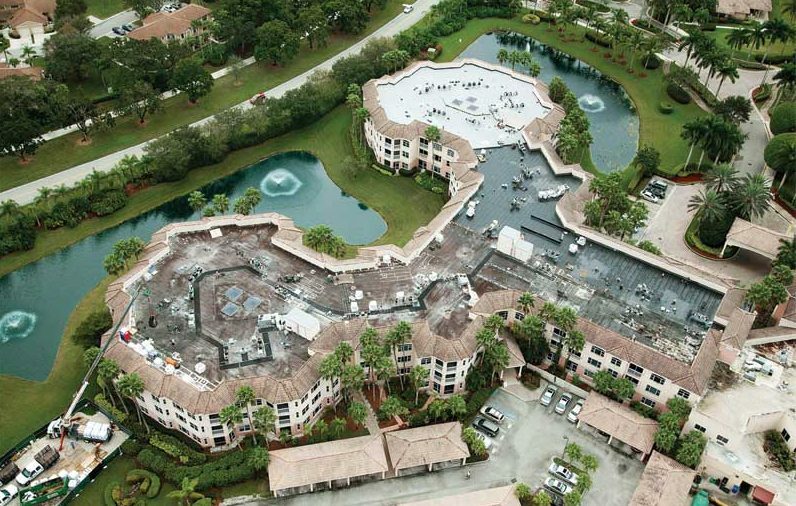 Heat-welding was used to install the mod-bit roofing system at the Court and Cove buildings of Devonshire at PGA National in Palm Beach Gardens, Fla. Devonshire serves as a popular destination for retirement living on a pristine and luscious 26 acres.In 2015, Advanced Roofing Inc. of Fort Lauderdale, Fla., was hired to reroof two buildings on the property. The roofing systems on the 4264-m2 (45,900-sf) Court building and the 4738-m2 (51,000-sf) Cove building had begun to deteriorate as a result of heavy foot traffic. Numerous air conditioning units located on the roofs had to be serviced regularly, often requiring heavy equipment to be brought in. As a result, the roofing systems were at risk of eventual failure, threatening the closure of the buildings. Advanced Roofing removed the existing roof down to the lightweight insulating concrete deck, and applied base sheets with twin-lock fasteners. From there, cap sheets were heat-welded. Two high-performing three-ply SBS-mod-bit roofing systems were then installed. 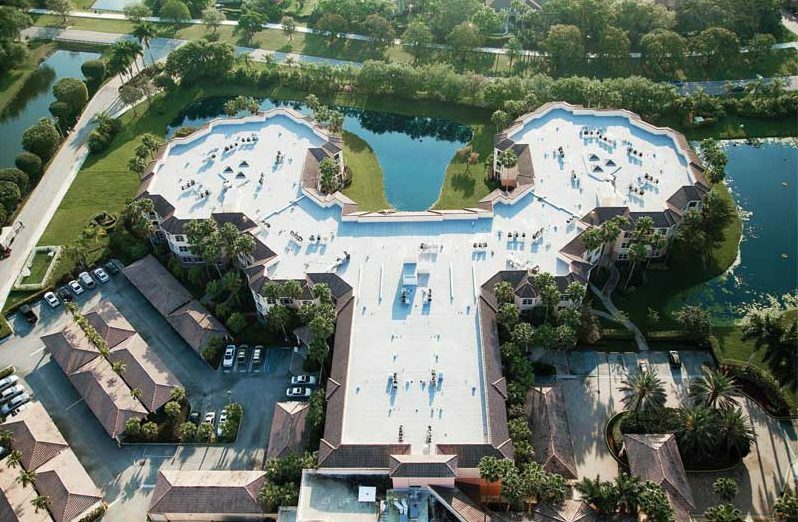 In this case, the chosen system helped prevent further leaking, was durable against foot traffic, and could withstand Florida’s unpredictable weather. Both mod-bit and BUR systems offer a variety of installation methods that provide long-term weatherproofing and versatility. Offered by most manufacturers, cold adhesive systems can be installed using rollers, sprayers, squeegees, or labor-saving machines. They do not require kettles, tankers, hot piping or mop carts, which are used in traditional hot applications. When using a cold-adhesive installation method, a roofing professional should take equipment staging, potential work disruptions, and environmental conditions into consideration. While cold-adhesive systems can be installed in a wide array of environmental conditions, appropriate considerations concerning optimal adhesive temperature should still be addressed. The minimum temperature for application of cold adhesive is 7.2 to 10 C (45 to 50 F); however, it is recommended the adhesive is maintained around 21 C (70 F) to optimize application rates and material performance. Surface rolling the membrane to ensure consistent contact and full adhesion is recommended. Another installation option is heat-welding. Heat-welding is the traditional mod-bit installation method. APP and SBS formulations of mod-bit membranes can be installed by either a hot air welder or a specialized propane roofing torch; many modified membranes are manufactured specifically for torch or heat-welding application. The hot air welding method uses hot air to melt the asphalt compound and is often used to weld seams. When this method is utilized, it is generally to weld the seams of cold adhesive, self-adhered, or mechanically fastened mod-bit membranes. Torch-applied systems require an asphaltic base sheet or another form of separator sheet when used over combustible substrates. Additionally, roofing professionals should take into consideration local building codes and specific training, such as the National Roofing Contractors Association’s (NRCA) CERTA program, which may specifically address safety aspects of torch installations. a consistent and monolithic membrane. The tolerance to extreme ambient temperatures, application forgiveness, and versatility of this installation method make it a popular year-round choice for contractors. Self-adhered mod-bit membranes utilize specialized formulations incorporating resins and polymeric materials in the manufacturing process. At the point of application, the adhesive requires a temperature of 7.2 to 10 C (45 to 50 F) or higher to ensure proper adhesion to the substrate. This is an increasingly popular installation method due to its versatility, ease of installation, and lack of flames or kettles. 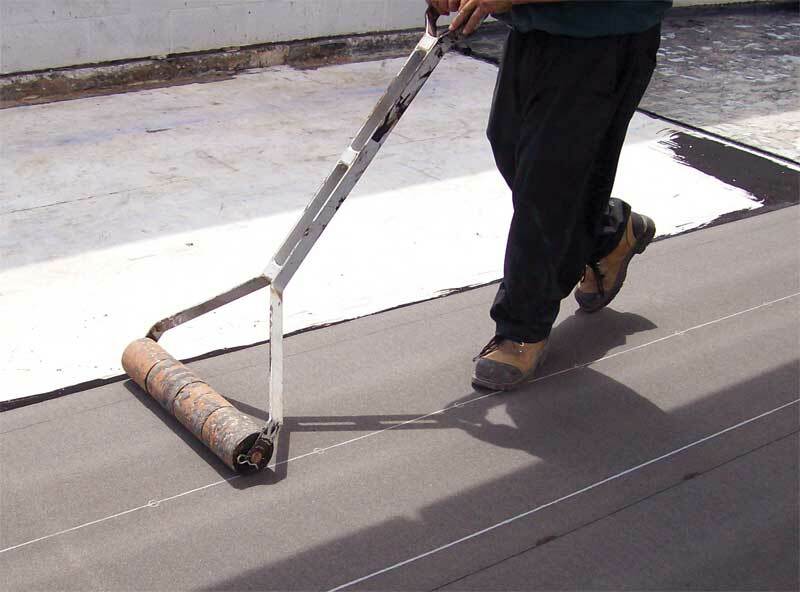 Self-adhered systems require the tools commonly used in all roofing applications, such as weighted rollers to help press the membrane into place against the substrate. Additionally, self-adhered systems bring added value through enhanced performance. These systems provide exceptional wind uplift performance and also serve as excellent air-barriers. In fact, both mod-bit and BUR systems are listed as air-barrier materials in model energy codes: International Energy Conservation Code (IECC) 2012, 2015, and 2018. No matter what type of low-slope asphalt product is used, or what installation process is selected, properly installed and maintained multi-ply asphalt roofing systems can provide durable, long-term waterproofing protection for the building. As with any roofing system, selecting knowledgeable contractors who are familiar with, and trained to install, quality low-slope asphalt roofing systems per the membrane manufacturer’s instructions will help to ensure a proper and long-lasting installation. Building owners, contractors, and specifiers should understand the differences among asphalt roofing products and installation options to make the best choice for their building or project. Asphalt roofing is able to take on the many tough challenges of low-slope roofing applications. Another example of mod-bit roofing’s superior performance is showcased on the Broward County Addiction Recovery Center’s Stephen Booher Building in Coral Springs, Fla. 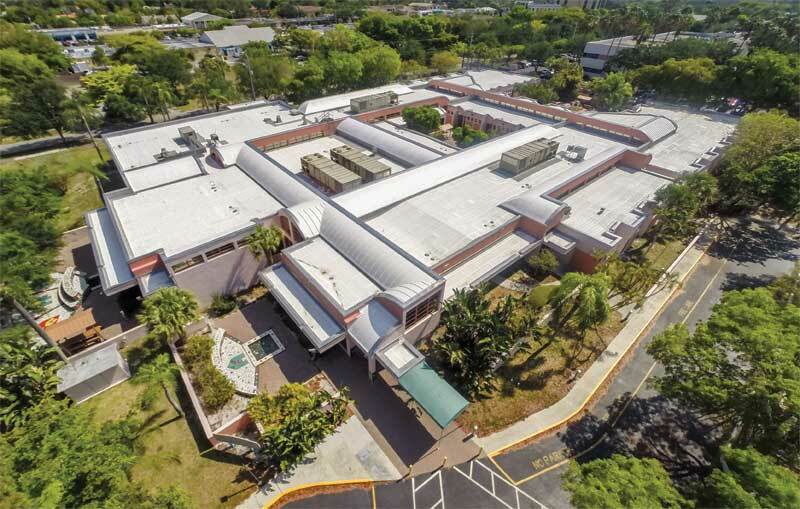 The addiction facility’s 4641-m2 (49,955-sf) roof was plagued with leaks caused by open laps from existing voids and roof transition areas.In response, Advanced Roofing Inc. of Fort Lauderdale, Fla., proposed a complete roof replacement and installation of a new mod-bit roofing system. An SBS-mod-bit membrane was installed with a mechanically fastened base sheet, followed by the heat-welding of all laps. SBS was chosen for its proven durability against the torrential rainstorms and high wind conditions common in the state. Tim McQuillen has worked in the building products industry for 25 years and is currently director of technical services for the Asphalt Roofing Manufacturers Association (ARMA). He has previously worked as the technical manager of codes for Firestone Building Products Company, where he coordinated and executed product testing programs to obtain and document building code compliance. McQuillen is a member of ASTM International and serves on the Technical Committee for ARMA, SPRI and the Cool Roof Rating Council (CRRC). He can be contacted via e-mail at TMcQuillen@kellencompany.com.